Last year I dutifully posted a single post dedicated to this topic daily, even during my trip to Gen Con 2014. Well, last year’s Kevin apparently had time on his hands because it didn’t even register as a possibility this year. No worries though, I’m feeding you all the info you need today. I know you’ve been waiting for this with baited breath (my answers to this…not who won the contest right?). So let’s get to it! That would be Phoenix Dawn Command by Keith Baker. The premise excites me the most, player characters expected to die heroically and return from the dead to fight once more. It’s been kickstarted and I for one can’t wait for the final product! 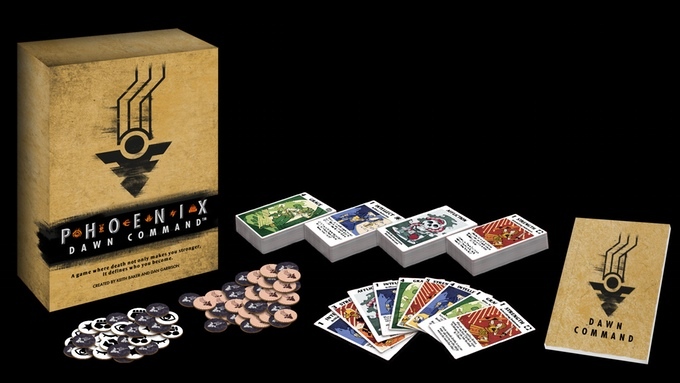 I actually missed out on Phoenix Dawn Command so I can’t reiterate that campaign. 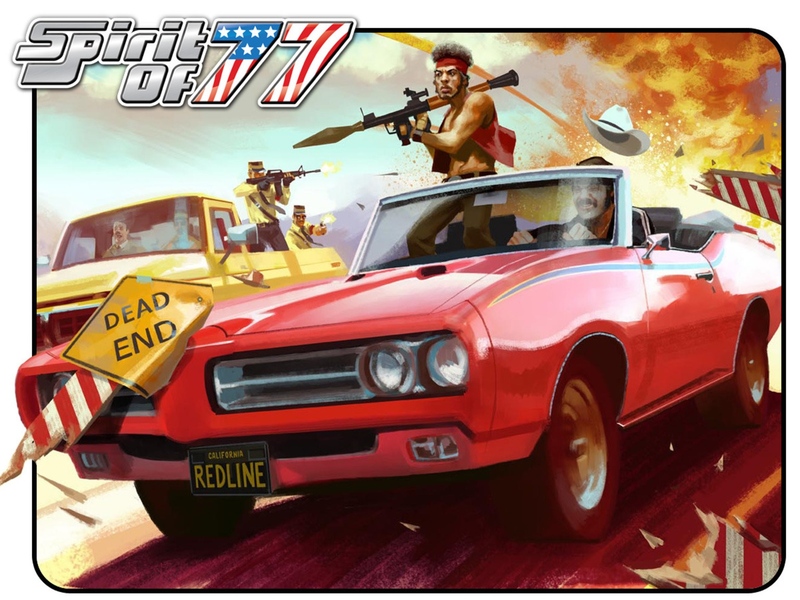 However, it’d be hard pressed to out-due my love for Spirit of ’77 anyway! I’ve had some immense fun reading through the rule-book ever since it arrived. Easily the most groovy Kickstarted I’ve ever been a part of. Has to be Unleashed. I wrote about it extensively here on the blog, and you should certainly check it out for yourself. The game uniquely places its players in the boots of some of the most savage “heroes” you could muster up. The concept works on all levels, and I can’t wait to run more of it at my table. 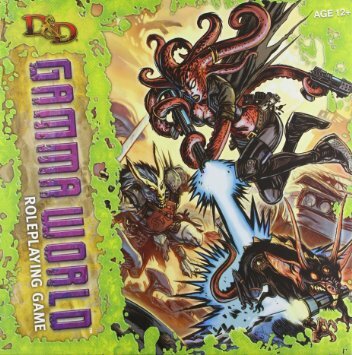 I’d go with Gamma World, the version made with a hack of the Dungeons & Dragons 4th Edition rule-set. What surprises me the most is how well it actually works. I’ve always been a fan of 4th Edition but I think some of the gaming concepts the edition brings to the table actually work best in Gamma World. A really fun, quick to set up, game. Still a go-to for me when I need something last minute. I don’t purchase a lot of RPG’s from the established companies these days, perk of being a blogger. I do back some of the Kickstarters I believe in the most though as they don’t have the resources to simply gift me a review copy. Some of the Kickstarters I’ve back recently have been Spirit of ’77, BattleBards, Of Dreams and Magic, Feng Shui 2, Karthun, & Fae Nightmares. I realize BattleBards isn’t preceisely an RPG but I like them enough to put them on the list. I took a jaunt over to Illinois recently to hang out with some of my buddies over at the Gamerstable Podcast to… help with something I’m not at liberty to discuss. Anyway, I got to play Pathfinder for the first time. I played a ton of D&D 3.X back in the day so it wasn’t anything I found myself being “introduced to”, it’s the same game really. I did get to play Greyhawk for the first time ever though. It was a huge pleasure playing games with those folks, always a good time. Nothing has changed from last year, my favorite free RPG continues to be Old School Hack. A fantastic little pick up game with some great support on it’s website. An honorable mention does go out to FATE though. I need to dig into that a bit more. I imagine this was meant to be “popular media” and I generally don’t care for how it’s portrayed honestly. I think Role-Play Gaming is just too personal a thing for me and any time I see someone trying to portray it they just get it wrong somehow. It can be the smallest quirk in how they decide to play and I’m out. I don’t get angry though, a poor portrayal isn’t going to ruin the game for me anyway. I kindof just let my brain leap to the first thing I’d love to play and I think I’d love an expanded world of Steven Universe to play around in. For those not familiar with the show I’d check it out. Has a great mix of comedy and an utterly intriguing world. Would be awesome to play a character as some form of Gem. 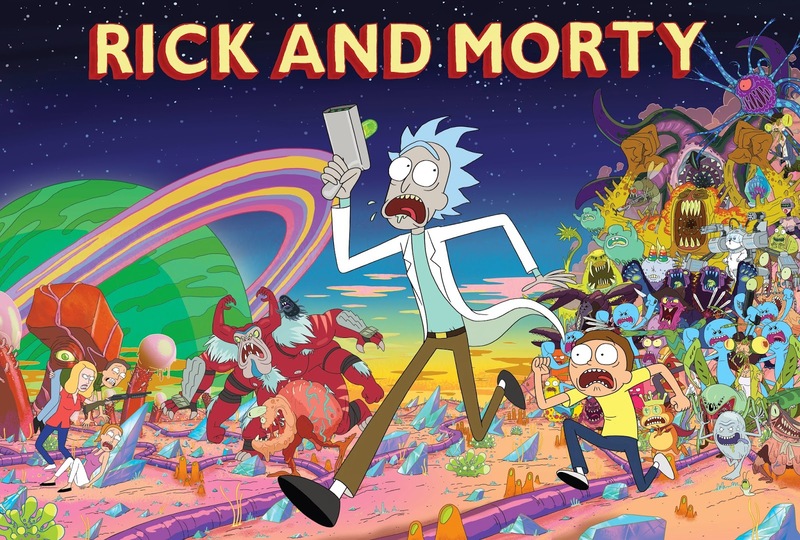 I’d also love to play a crazed Rick and Morty RPG. I’d have to go with Pinnacle Entertainment Group. They make Savage Worlds and a number of the Campaign Settings I love from the rule-set. 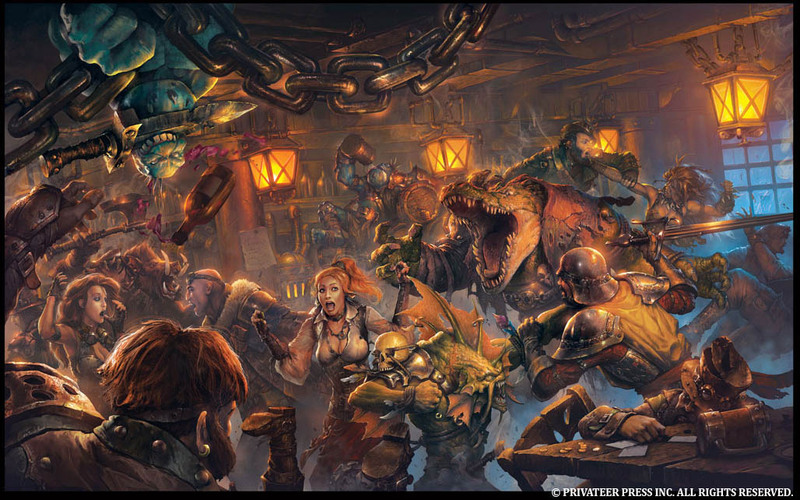 I’m also a huge fan of Privateer Press these days, I mean Iron Kingdoms and Unleashed are amazing. This one’s tough but I’ll go with Keith Baker. The guy is just so friendly to fans and he made my favorite D&D setting of all time, Eberron. 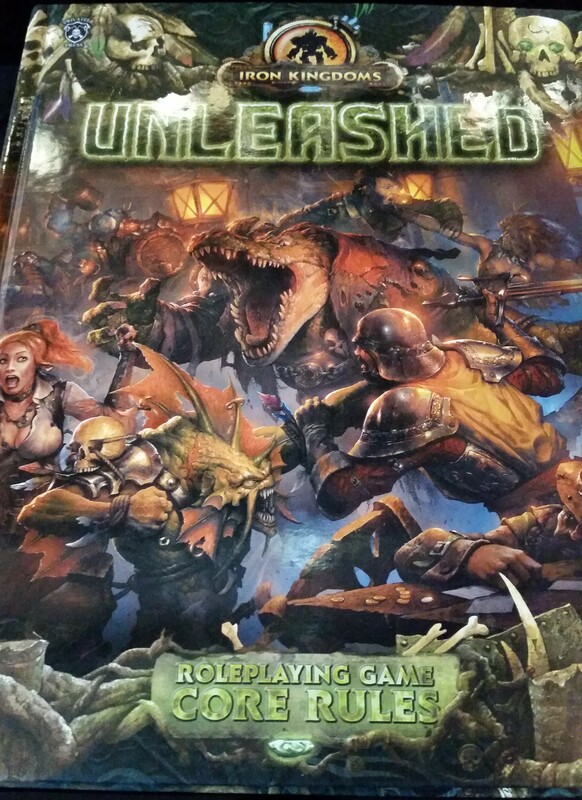 Currently I’m digging the bar fight from the cover of the Unleashed book. 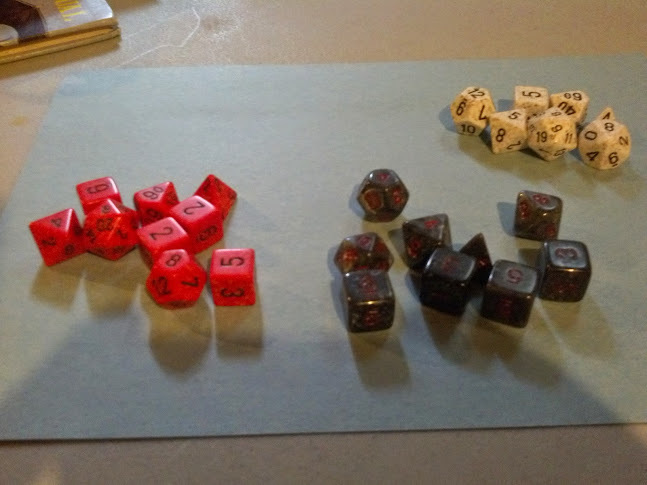 My most go-to RPG Product would be my dice I guess. My three strongest sets of rollers! I’ve always been really excited by the prospect of what the folks at Trapdoor Technologies keeps trying to bring us and they seem to have found their place lately with their app Playbook. It’s a soft launch of the product with more to come but go check it out! Back in high school our main DM Mike “The Meatfist” ran a D&D 3.5 game set in the Forgotten Realms that lasted years and took us from level 1 to level 18. Solidly long game. Wish we’d actually tied it up with a true ending. Honestly this could be represented by any number of games I played back in college. There were times we’d start in the afternoon and leave the house with the sun peeking out for sunrise. I can’t name one single time that was the longest though. It’s Dungeons and Dragons, it will probably always be. I love the concepts in Numenera, and would love to play it more, I just can’t run the game. I have a mind built for fantasy and Numenera is too weird for me there! Eh, never been a huge fan. Maybe I just need a GM who can introduce me to a game where I actually enjoy it. Dread. I love the added thrill of the Jenga tower. I do need more exposure to other horror games though. With friends. Cheesy as Hell, but there it is. I do prefer an in person game to one over the net. One where everyone is involved with only slight distraction for cutting a few jokes. Plenty of role-play with characters that everyone wants to play, and interesting combat. Not worrying about stuff like arrows or food and water. Conversations with friends and colleagues. I love tapping into resources like The RPG Academy Network I’m a part of or The Vagabond Gamers G+ group I helped start. We are all gifted creatives and bouncing ideas off one another rocks. Can’t say I have tons of experience with this one but I do enjoy taking a gaming style from on area and making it work in Savage Worlds. For example when Gamerstable took Conan and used Savage Worlds to run it. My Eberron game from a few years back. Loved the players’ characters, my NPC’s, and where the story was headed. Sadly it fell apart. Non-Revivable. You mean other than Melvin Smif’s Geekery? 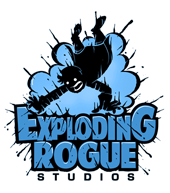 I’m a huge fan of everyone in the RPG Academy Network, you should certainly check them out. Other than that I like The Angry GM‘s stuff, Gamerstable Podcast, Monkey in the Cage, and Dyvers. Probably Steven Colbert. He wears it on his sleeve pretty heavily and I think the more you see that the more likely others are going to want to try the games. Video Games. Without RPG’s most of the things people really dig in video games would have been less likely to ever show up. Hit Points, Experience, Levels. You can thank RPGs for that. There you have it folks! Let me know some of you answers below! As an added note, I’ll have the winners of my contest posted by Friday September 11th! Don’t forget about the AcadeCon Kickstarter either! It’s winding down but there are still badges to pick up. Would love to see you there. A cloud of breath issues forth from the haggard, bearded face of the Norseman as he looks upon the dwarven encampment below the snow bank. He gives the signal. His brothers and sisters in arms pour over the bank, into the sleeping camp. Savage smiles erupt on their frost covered faces as they realize they truly did have the element of surprise as their ally in arms tonight. Hot dwarven blood steams on the cold ground as the dwarves attempt to rally the camp, but they are losing the battle. Suddenly, the ground trembles as an enormous figure rises above the tree tops. One of the duergar metal giants! A second, this time frantic, signal is given. Fleeing is not in their nature but they are no match for such a monster of metal. They retreat into the night as the Dwarven Destroyer closes in swiftly, one massive footfall accounting for ten of the fleeing group’s. All seems lost as they cross into another tree line. A massive hand reaches for one of the sword maidens near the back of the group. She readies her sword and sets her stance, prepared to set foot in Valhalla if need be! At that moment a massive bony fist crashes into the face of the Destroyer, sending it reeling backward. Two more Bonebonded slink from the trees and confront the Destroyer, it is three against one. The Norseman leads his party away from the clashing of giants behind him, the trap was set and sprung to perfection. Pride for his clan swells in his chest. 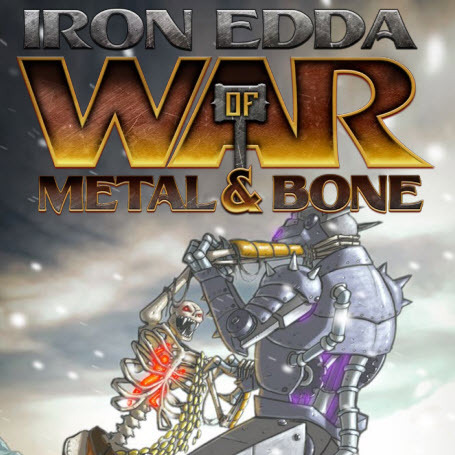 Iron Edda: War of Metal and Bone is an exciting RPG setting unlike anything you’ve ever seen. Using the Fate Core and Fate Accelerated Edition systems Tracy Barnett and his team have created a world of Norse mythology on an epic scale. The inhabitants of Midgard are very similar to the ones you may be familiar with but with one large, very large, difference. This is a land where giants of metal, bone, and even wood stride to war aside men and women. 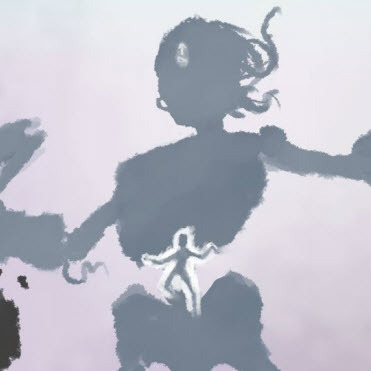 This is adventure on a grand level, well fleshed out for wildly different scales of conflict. The ideas are fresh and the source material is certainly appealing to my tastes. This has gotten me even more interested in exploring Fate more than I have in the past. Tracy Barnett seems to have a knack for choosing artists for these projects. Iron Edda enjoys an artistic tone that perfectly matches a good Norse myth, and is laid out in a manner that never distracts. Currently I only have a .pdf version of the book but I certainly look forward to one day holding one of the softcover copies (obviously kicking myself for missing the Kickstarter). The tone of the book is one of teaching by example. We see this a bit in other systems but Tracy and team have taken it a step further here as there are large portions of the book dedicated to running the reader through some of the more major rule benchmarks. An early example of this is an example of the rules behind the Setting Creation system. I love this concept, there are rules for randomly crafting a Holdfast for the group to play in. Not only does this encourage the game as the pickup variety but it will help those who may be somewhat unfamiliar with Norse mythology familiarize themselves with their surroundings. There are already countless options that the Holdfast Creation table provides but I can see that as an area where expansion material could be added. Regarding the “Example” laid out in the book for the setting creation we have five pages of dialogue playing out the creation of a Holdfast, this isn’t the exception it is the rule. As mentioned above nearly all major sections of the book are played out through such examples. It may not be the best method for all, but I found it to be very helpful in explaining the information to me. It feels conversational and relaxed. I learn better through play than I do parsing rule text and this feels like playing to me. 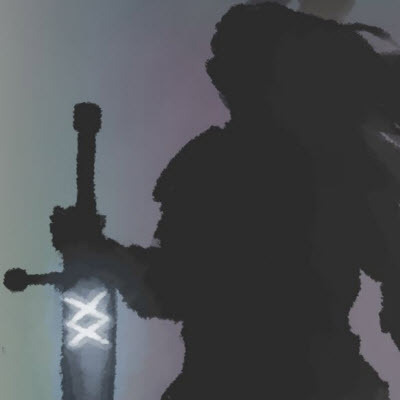 After creating the setting we are introduced to character creation and how characters in Iron Edda play compared to other versions of the Fate systems. Characters derive much of their backstory from the plot threads in the Holdfast Creation and typically have a shared history. Characters also have a few other differences including a plethora of additional Aspects, some stunt chance ups, three different levels of magic, and the biggest change where everyone must deal with the potential for adventure under three levels of scale. The three levels of scale include Human Scale, Giant Scale, and Epic Scale. Human Scale is obviously the default and operates almost exactly like any regular Fate game. Once you kick things up to Giant Scale with Destroyers, Bone-Bonded, or Alfar treewalkers you can imagine toe to toe they would operate link anything else but having Human Scale interact with them involves treating the Giants as truly terrifying aspects of power players have to treat the creatures as parts of a whole. Epic scale is regulated to some of the more godlike creatures in Norse Myth. Imagine running into Nidhogg, the Dragon! You don’t destroy something like that, you beat it back and hope to never see it again…if you survive that is. Following the information regarding characters comes a solid write up of the overarching setting of this version Midgard. 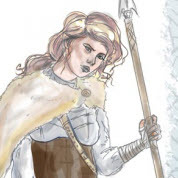 Clans are well fleshed and it is written in a great storytelling manner the lands are presented to us by Helga Fenrirsdaughter, and it makes for a nice read, much better than a dry layout. We are given a lot of major Holdfasts and some matching Aspects in the major lands of humans and are even treated to some information regarding the other denizens of Midgard like the Elves. We are given enough to play with but thankfully not reams and reams of text explaining every small detail. A good amount of info for us to work with. The last section of the book proper, “Running War of Metal and Bone”, helps Gamemasters prepare themselves for running the game. Largely the game will follow many of the same guidelines you may be familiar with in Fate but there are a lot of nice hints for things like some speedier ways to handle threats and a few reminders for how to handle the varying scales. Added in are some good resources across multiple mediums for brushing up on your Norse Knowledge, I especially like seeing some musical choices added in. Lastly we are treated to some parting words, a bit of a pep talk to remind you to stay true to yourself when running the game and play to your strengths, you’ll do fine. Beyond the main book we are gifted with three adventures. A Tale of Blood and Darkness, by Lillian Cohen-Moore, The Throne that would be Bone & Wrath, by Ryan Macklin, and Remains, by Quinn Murphy. These adventures look to be a great example of crafting your own game beyond being excellent adventures in their own right. It is excellent to see this great additional material tacked on for readers. Obviously I enjoyed my time with this product and have few complaints. I would have liked to see a decent index at the end of the book and maybe a bit more about the Dwarves, maybe even playable versions of the Dwarves and Elves for that matter, but honestly Norse Myth has always been about the men and women of the clans so playing as a Dwarf or Elf would be something very different. Overall though this is a strong Campaign Setting for Fate rules and the team behind it should be proud. It’s no wonder the Kickstarter met a number of stretch goals beyond its initial fund point. It is currently available on Drive Thru RPG as a solo purchase or as part of a bundle that includes the novel, Iron Edda: Sveidsdottir written by Tracy Barnett as well. I’ve yet to read the novel but I certainly enjoyed the more narrative portions of the RPG sourcebook so I have a suspicion I’ll enjoy the read. If you’re a fan of Norse Mythology, or fantasy gaming in general, I urge you to grab this unique campaign setting. Though the game studio Exploding Rogue, the studio Tracy co-founded with Brian Patterson, is still in its infancy, items like this tell me we’ll likely be seeing some great things from them in the coming years. I’m looking forward to it.